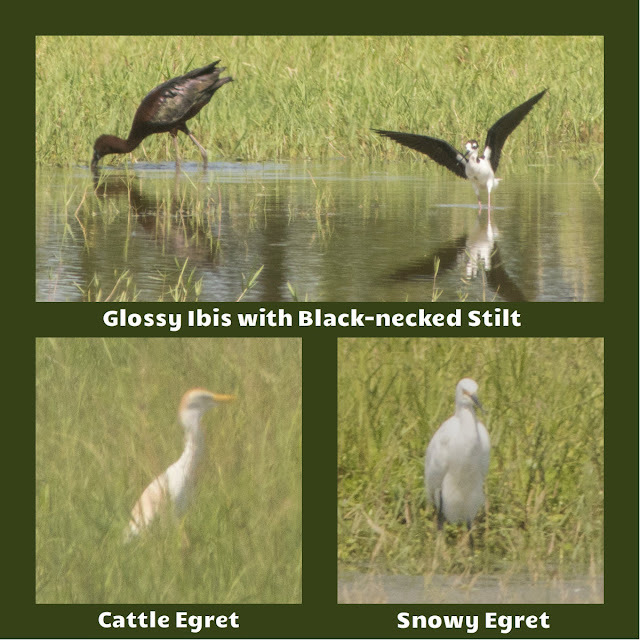 Great day for birding today! 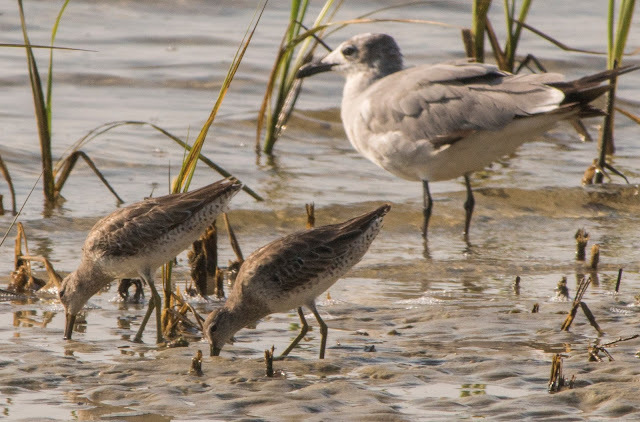 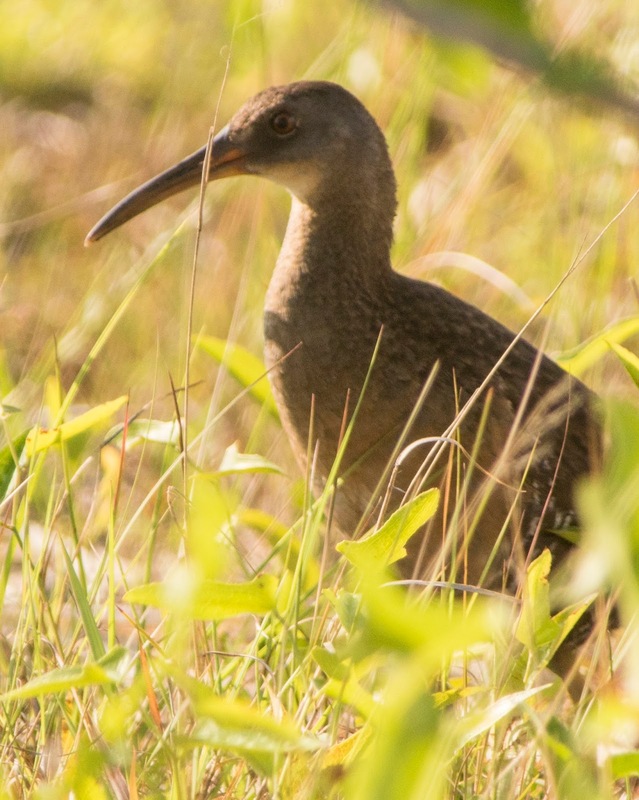 As I am driving out to Pine Island this morning, I see a baby clapper rail running down the middle of the road, a life bird for Florida, but I knew immediately what it was. 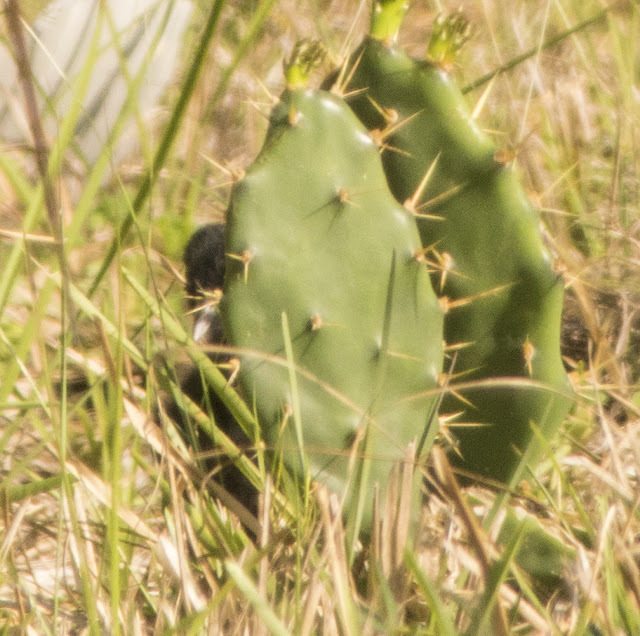 He ran to hide behind a cactus, and then, luckily I saw one adult cross to the same side of the street (although still a great distance away) I heard at least one more baby calling still on the other side of the road. 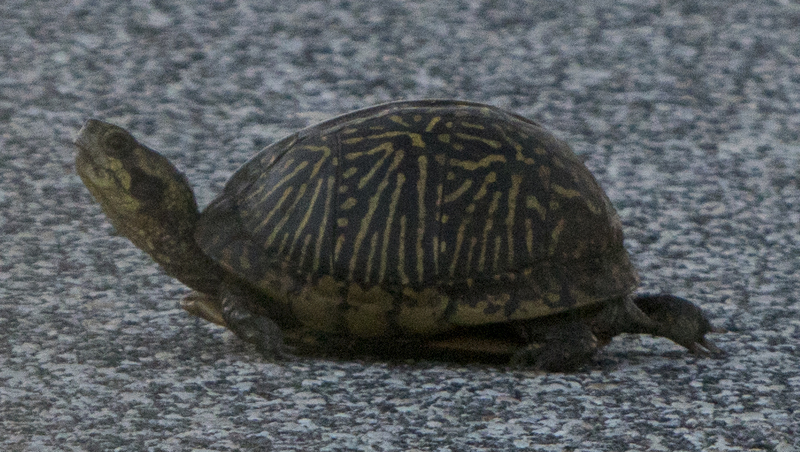 I quickly snapped a couple of photos and continued on to the park. 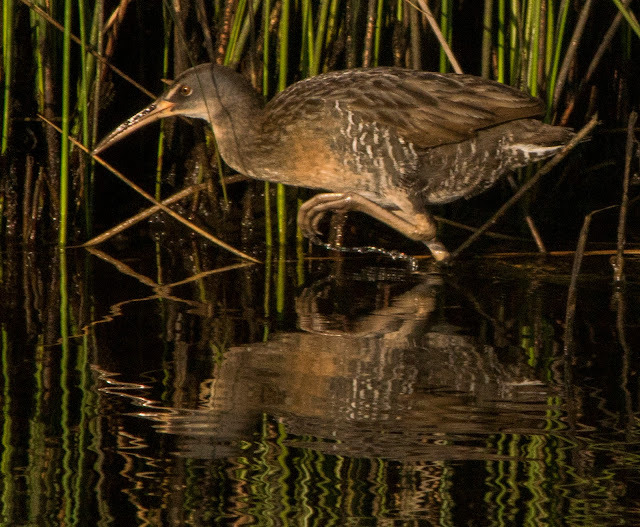 At bayport, I got some great shots of yet another clapper rail, this one much more colorful than the one on the road. 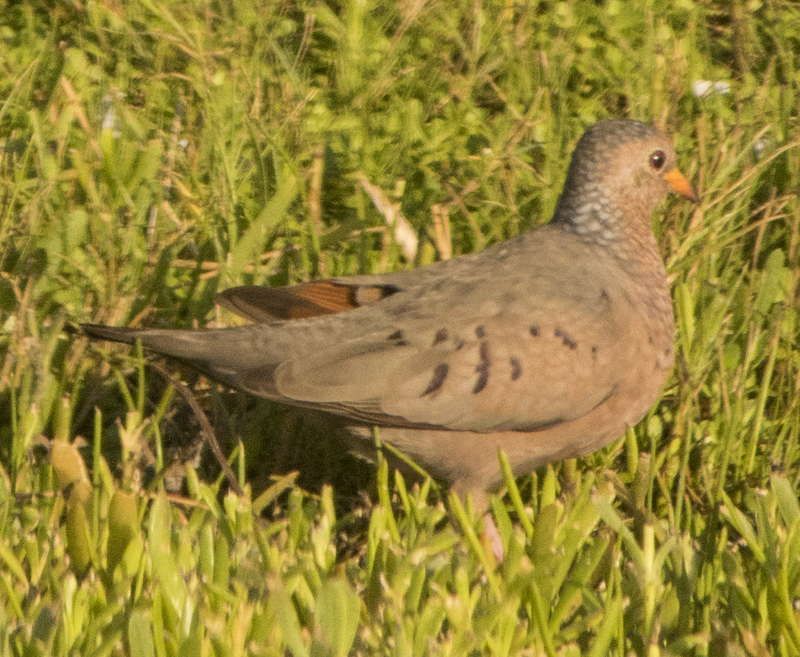 Also found a ground dove (another good bird for June Challenge) and a box turtle (only the 4th one I have ever seen in Florida)! Moving over to the other side of the county, I was able to end the day with a total of 65 species for June Challenge. I heard 5 others, but could not count these unless seen. At least I know they are out there for next time. 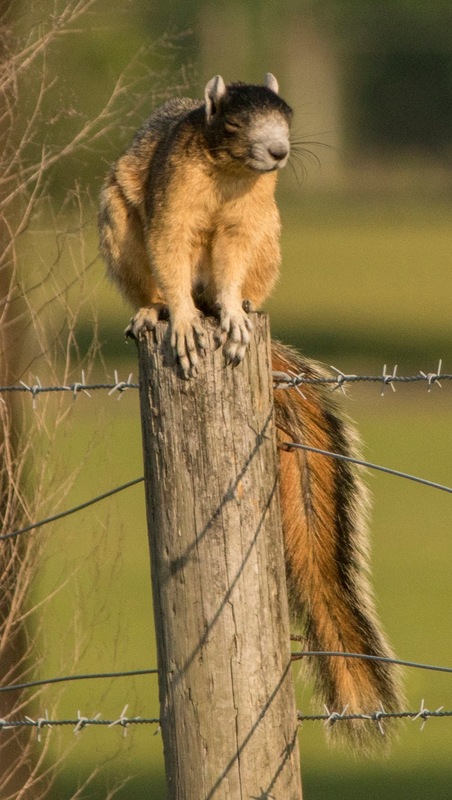 Not bad for being at work the majority of the day! 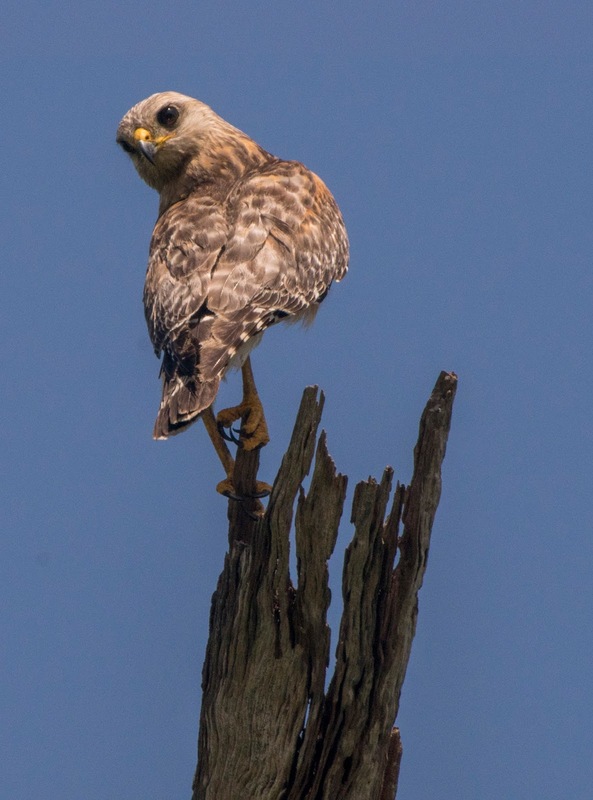 Best photo of the day: Red-shoudered Hawk up close, watching me watching birds at Bystre Lake. 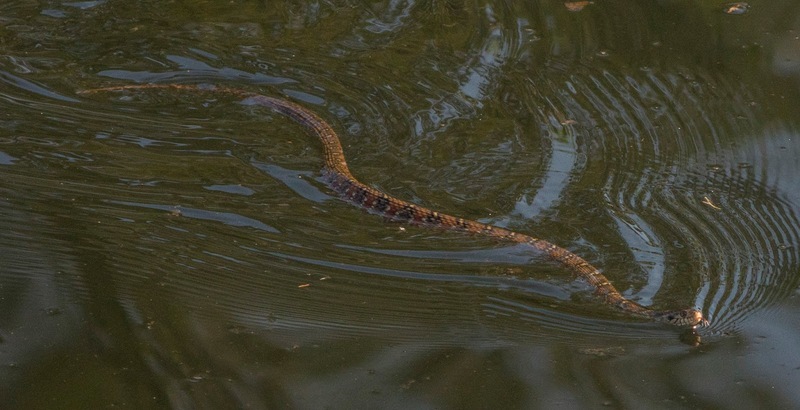 After work, McKethan Lake was a great spot to end the day. I saw a swallow-tailed kite acting like a skimmer and diving into the water to skim the surface (for bugs?) 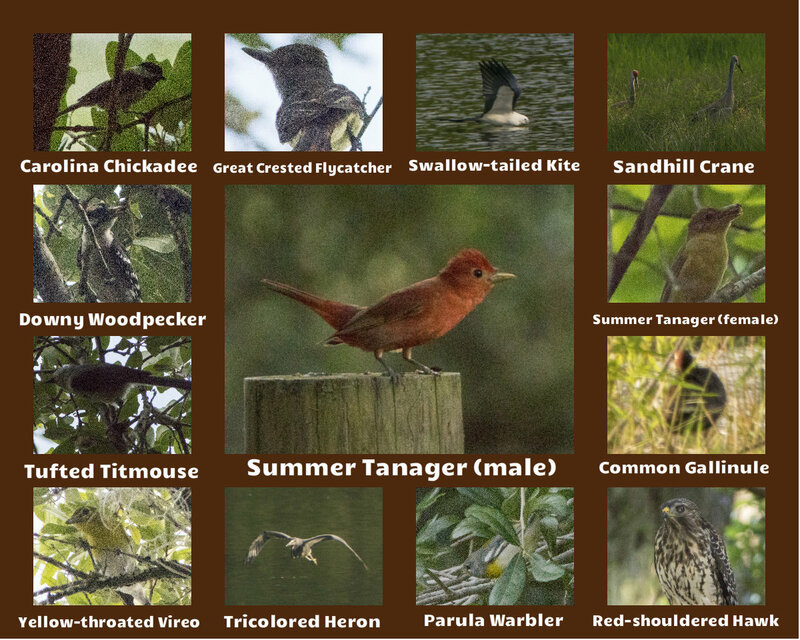 Also found a pair of summer tanagers. 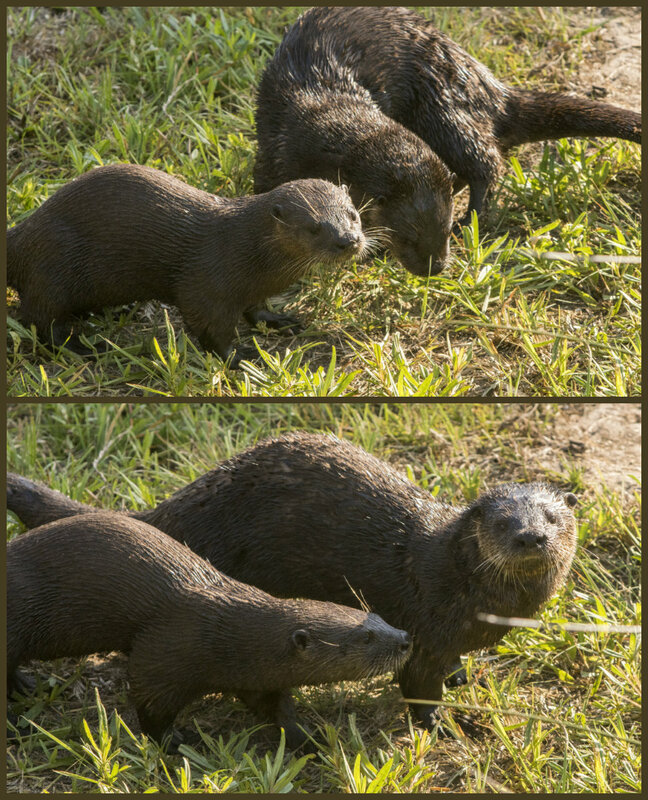 The male was really looking out for the female and being protective of her following me as I walked around looking for her. 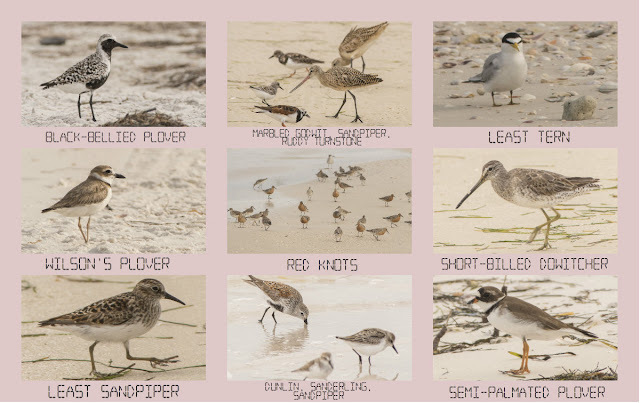 A few more stops along the coast and I was up to 33 species by 9AM! 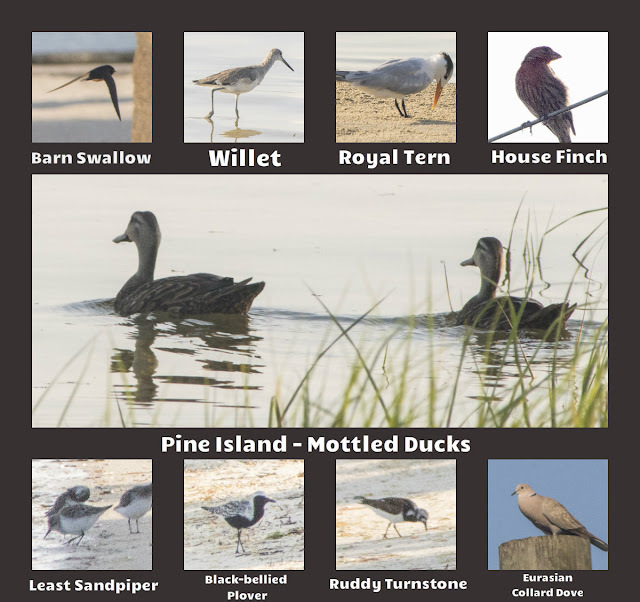 A few at Pine Island I didn't even see all June of last year: black-bellied plover & least sandpiper and two it took me a long time to see last year: house finch & royal tern. A great find for Jenkins Creek: Juvenile Black Crowned Night heron. 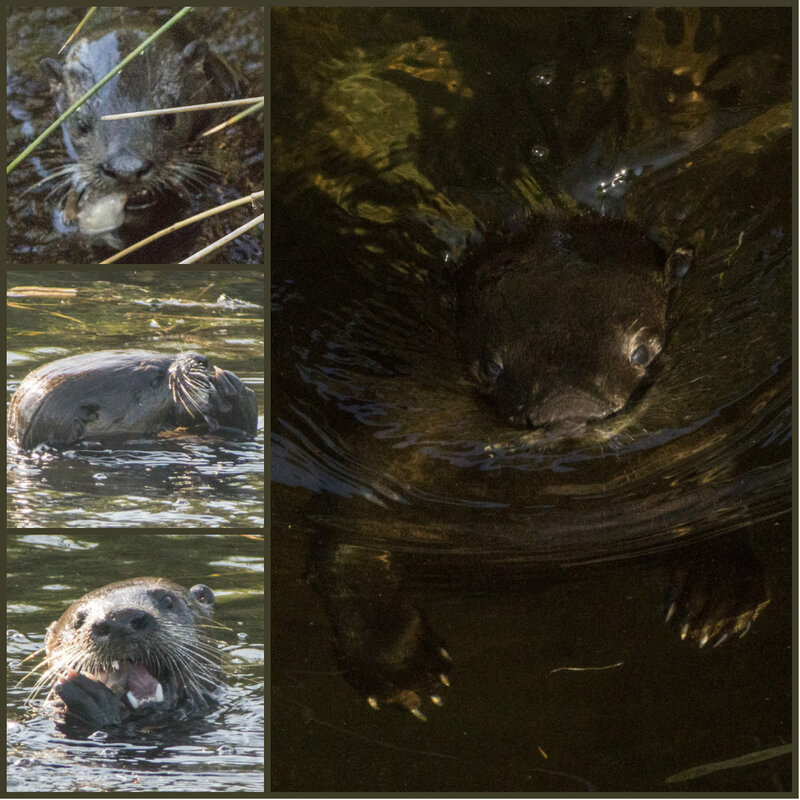 However, the stars of the show were the river otters with one crying baby that was apparently very hungry, and one quieter, older baby. 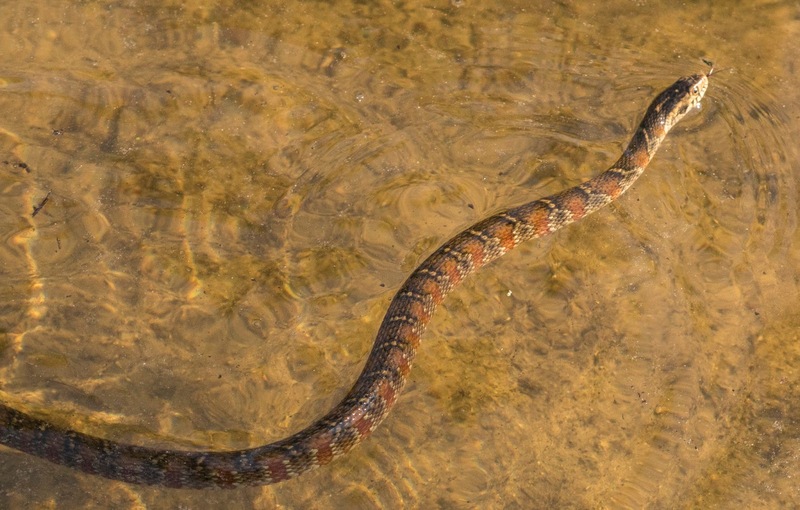 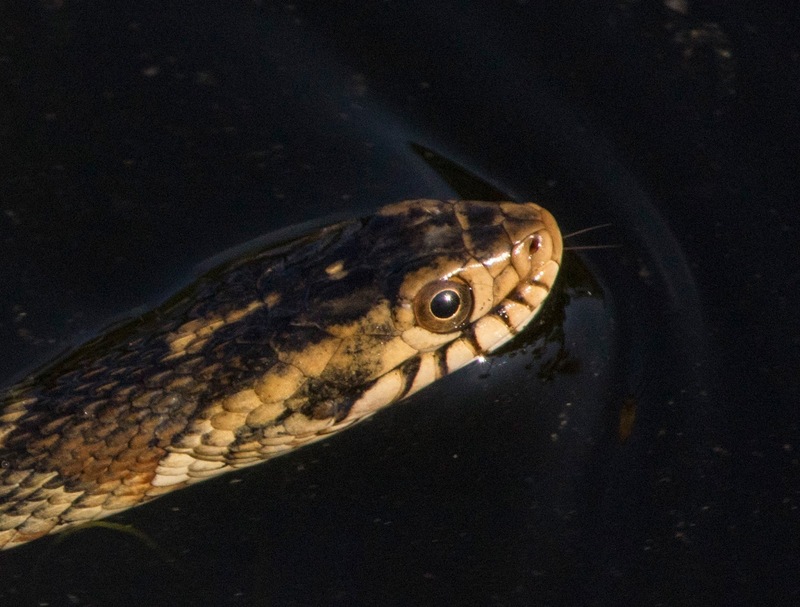 Finally, at Linda Pederson, a juvenile water snake was the main animal I photographed. 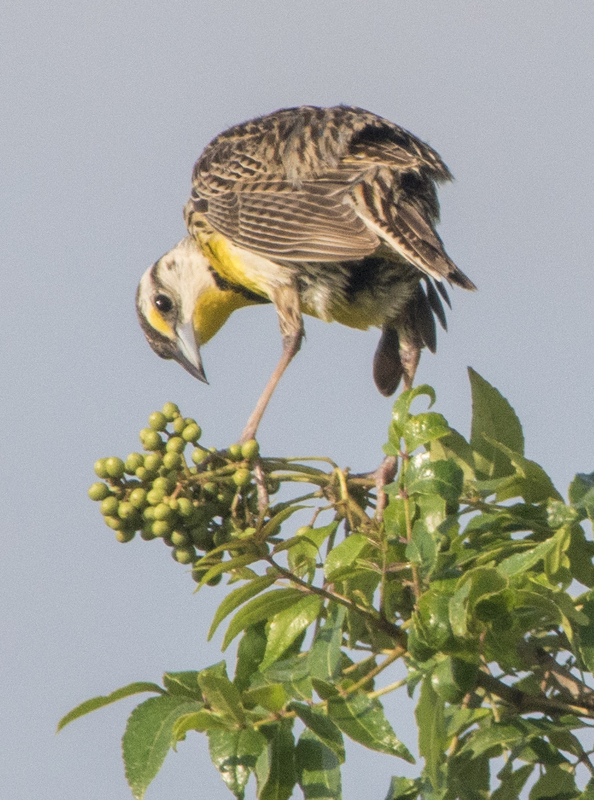 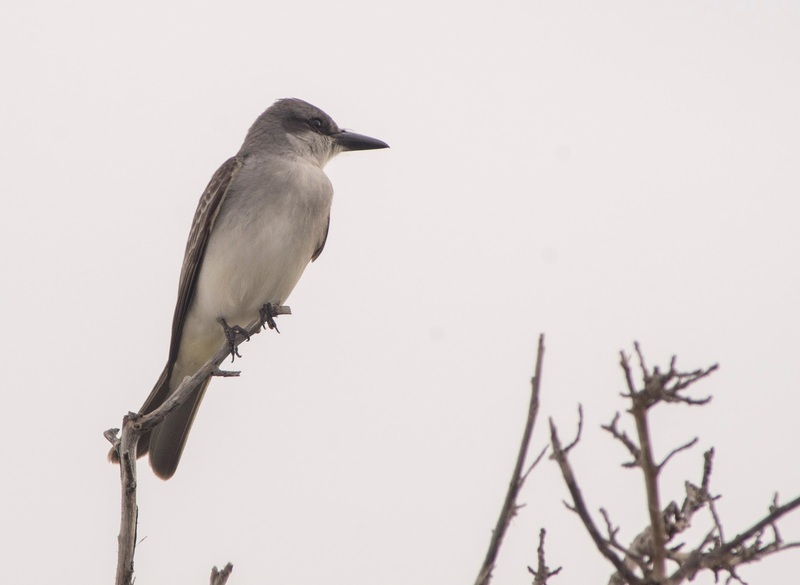 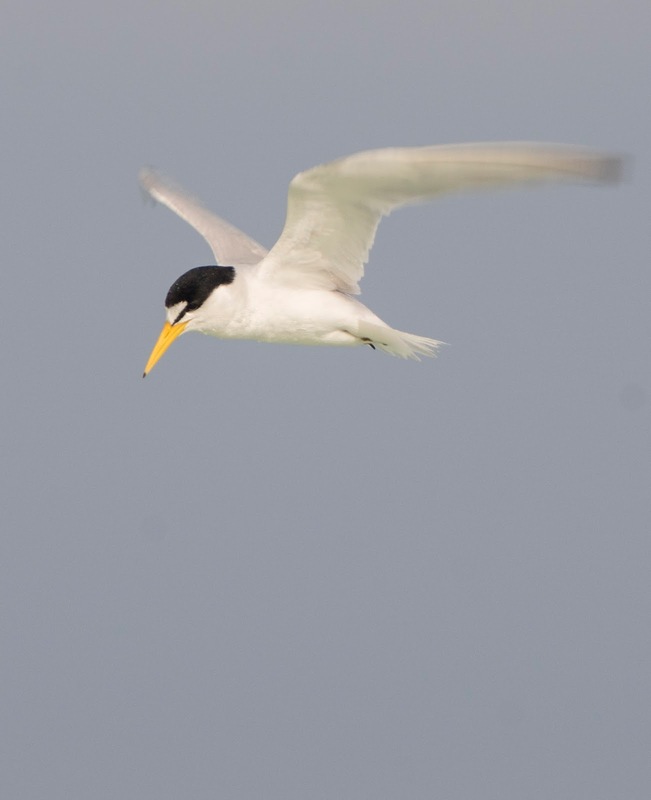 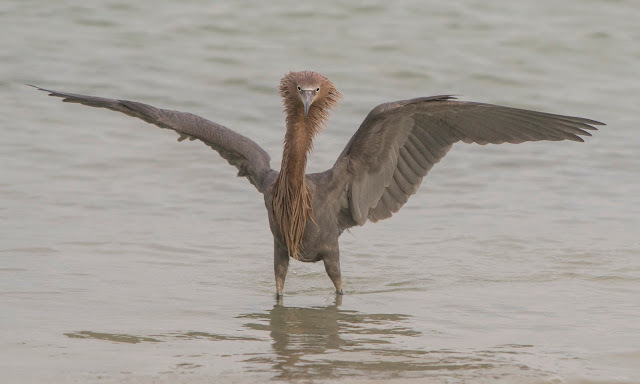 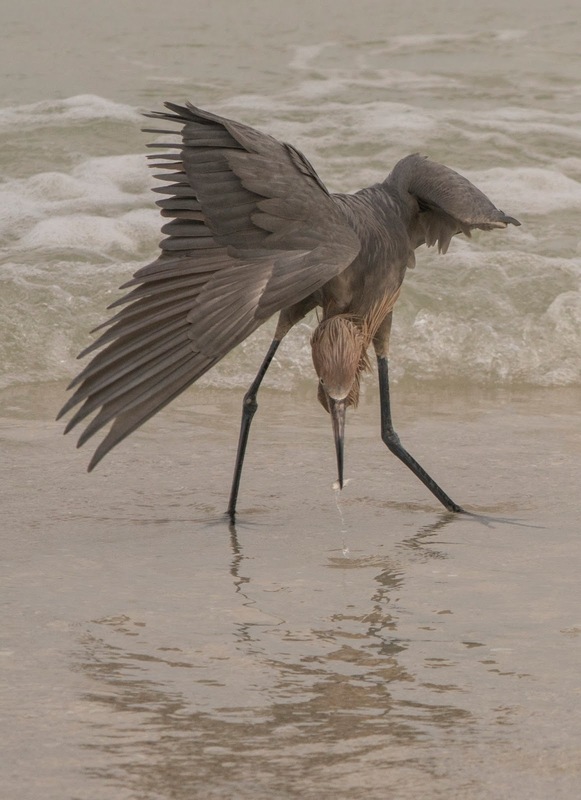 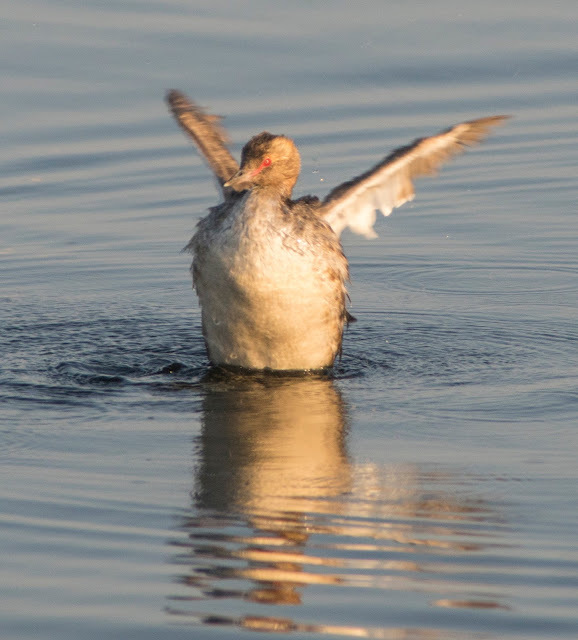 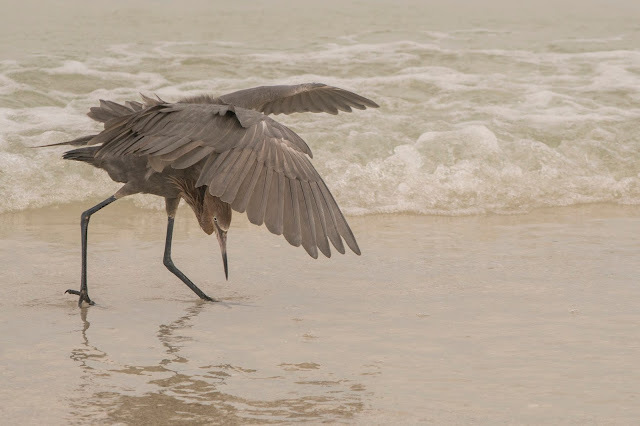 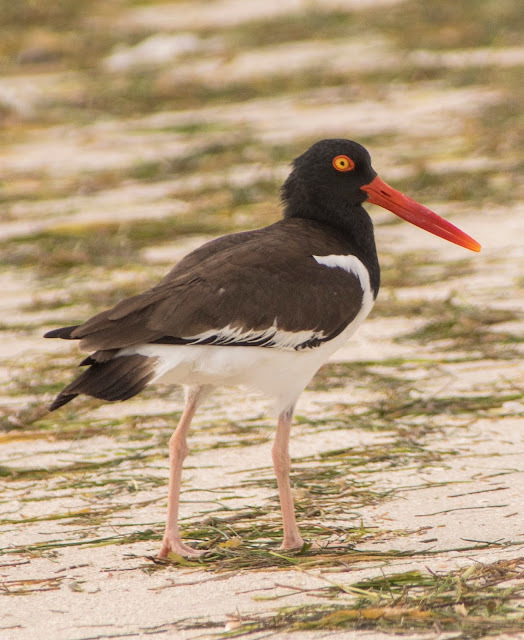 Every June, some of the local Florida birders enter into a competition to find the most birds in a county (preferably your home county) during the month of June. This is the second year I have participated and it is off to a great start! 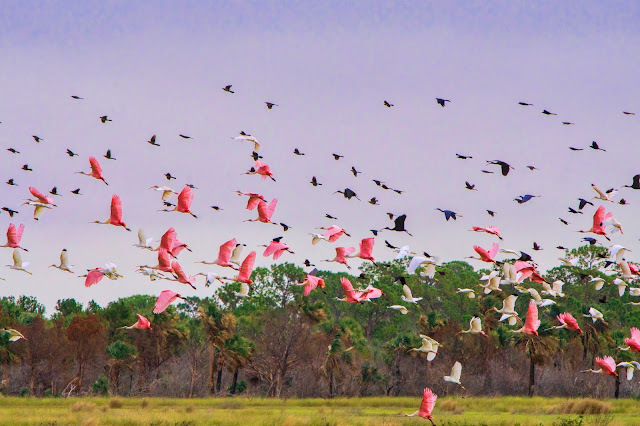 Today I took the day off from work and birded Hernando county. First stop was Bayport park at 7:00AM. 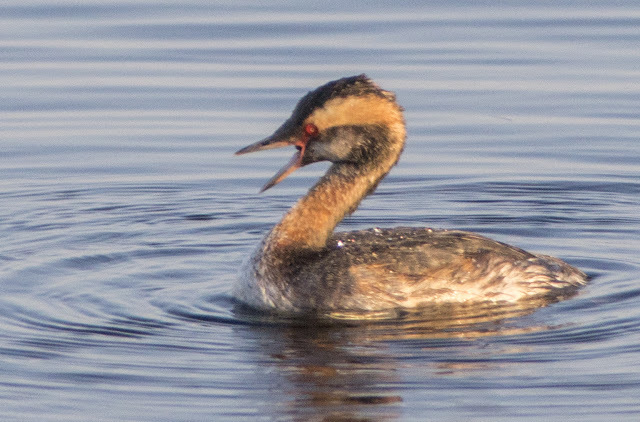 I was surprised to find two winter birds still here: Common Loon and 3 Horned Grebe in partial breeding plumage. I heard a rail, which sounded to me like a king rail instead of the much more common clapper rail (neither of which I have seen in Florida yet). Couldn't find him though! Also found this huge stingray just swimming by. 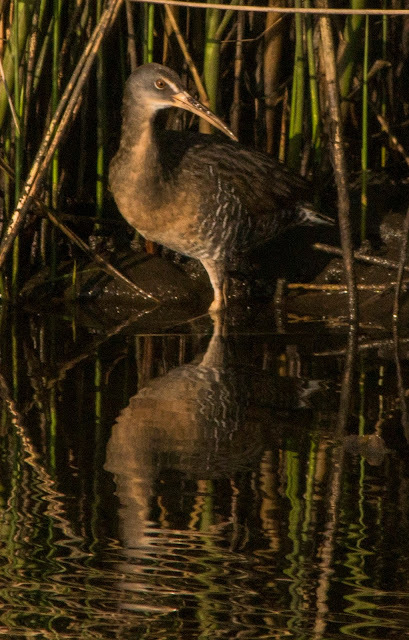 If you look closely in front of the reeds, you can see two wing tips. 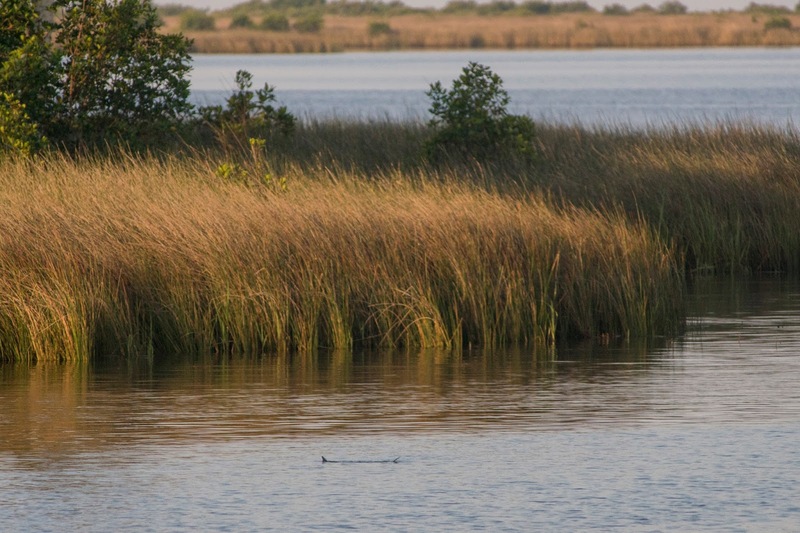 There was a manatee here as well, but no good photos. 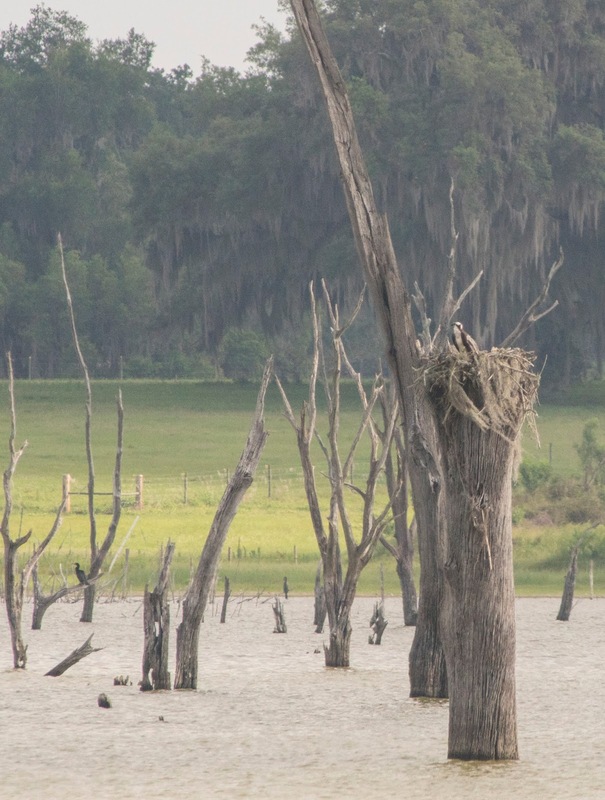 10 months ago I photographed a Mississippi Kite release at this location, where an adult and juvenile were released. The location was suggested for the release because a Mississippi Kite had been seen here a previous year (for several weeks) by other birders, and it is very unusual to see one in this region. 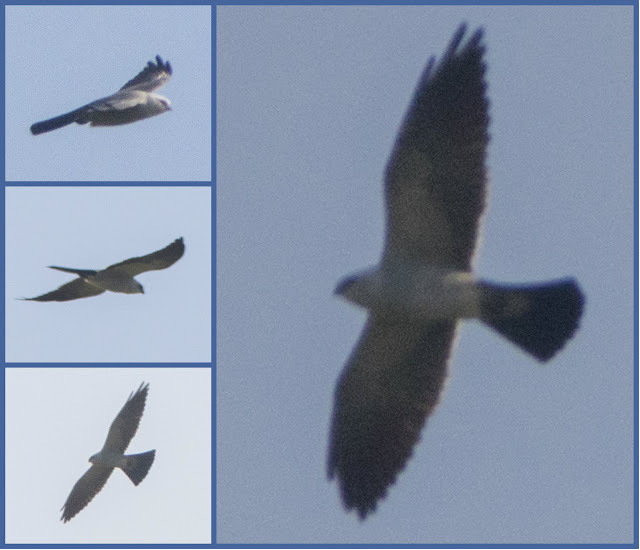 Today, I saw my first wild Mississippi Kite (even if it might be the one from last year). 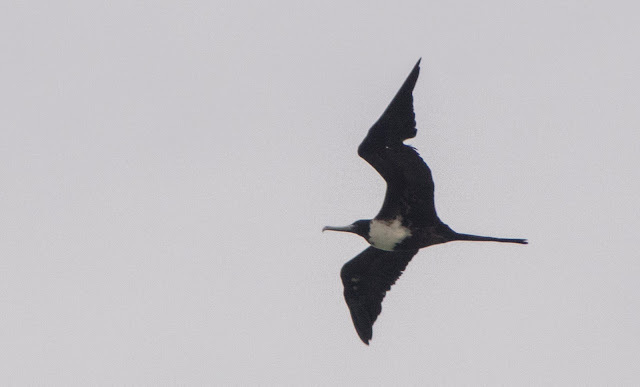 He was soaring pretty high, so the photos are not great, but definitely good ID shots. 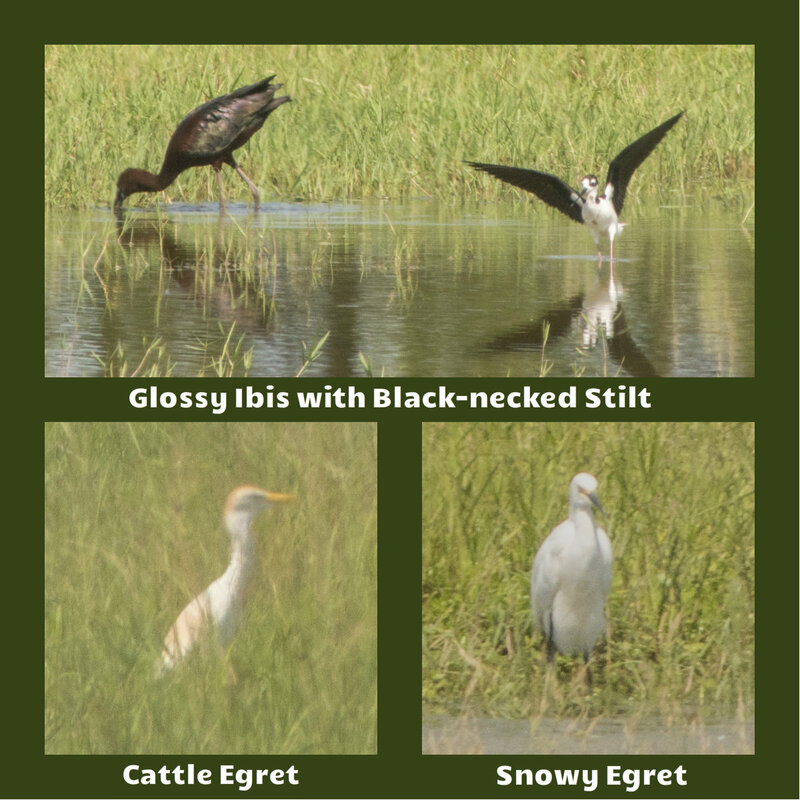 I was excited to participate this year again in the "Global Big Day" from Ebird. 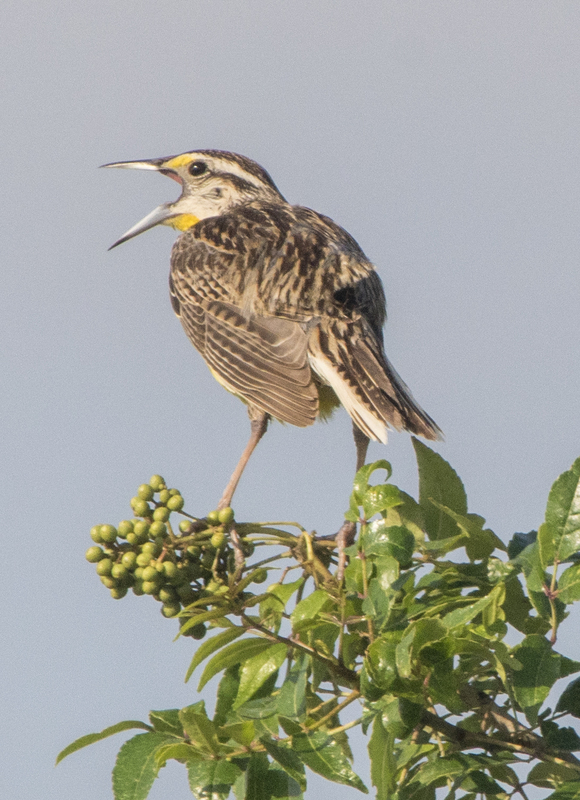 Mostly America, but many other countries submit reports and over half the bird species on earth (5,000+) were seen again this year. 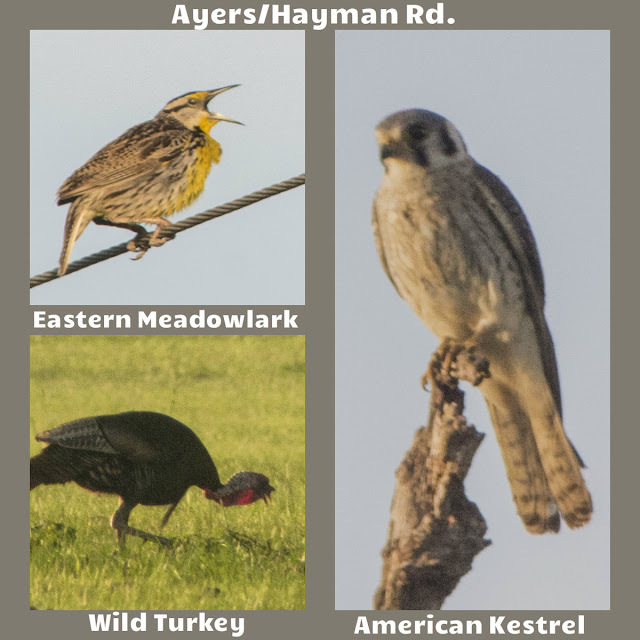 My contribution was 40 species at 8 locations in Hernando. 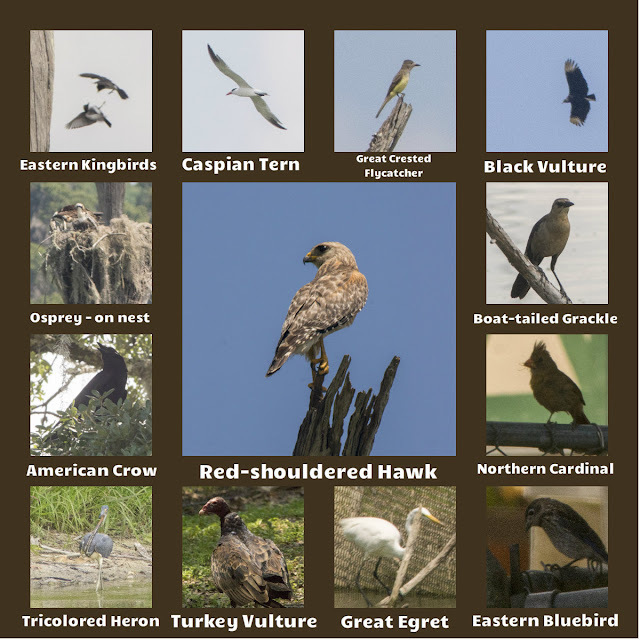 I only had 2 hours today to go out, but I actually found a life bird, the Mississippi Kite. 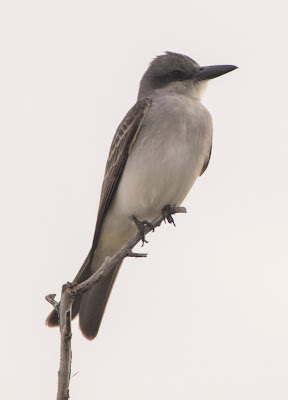 Other good finds for me were Swallow-tailed Kite, Eastern Kingbird, Spoonbill, Purple Martin, Red-headed Woodpecker, Meadowlark, and Red-tailed Hawk. 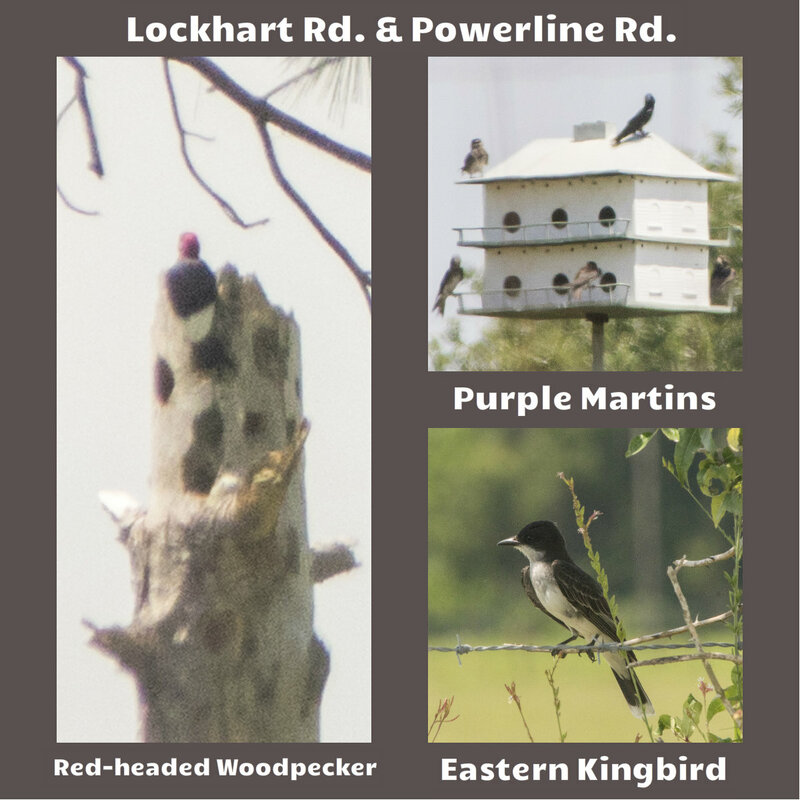 First stop was Powerline/Lockhart Road. I will do a separate post about the Mississippi Kite, but above is a photogenic Meadow Lark I found. 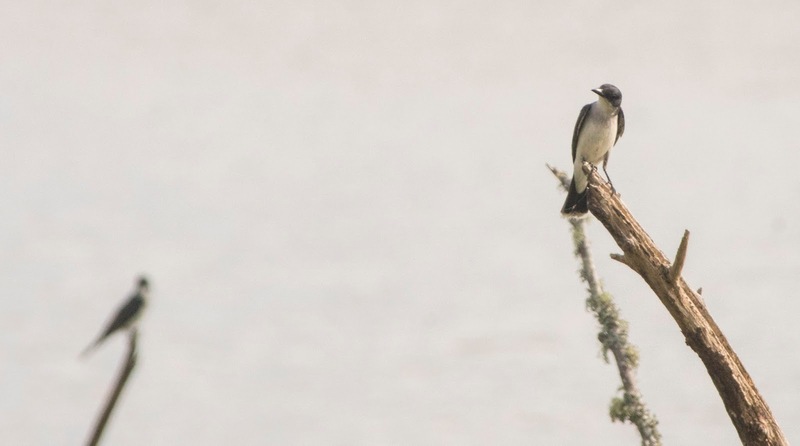 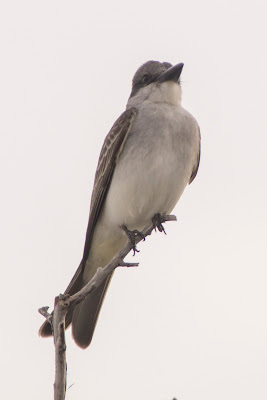 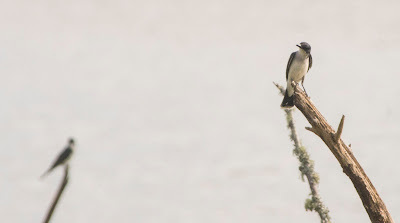 At Bystere Lake in Brooksville a pair of Eastern Kingbirds and Osprey pair. Also found the 2 spoonbill here, but too far away to photograph. Finally, the Brooksville water treatment plant. Unfortunately I had to change cards almost right when I got here and the card I put in was locked and did not take any photos, so there may have been more here I missed. 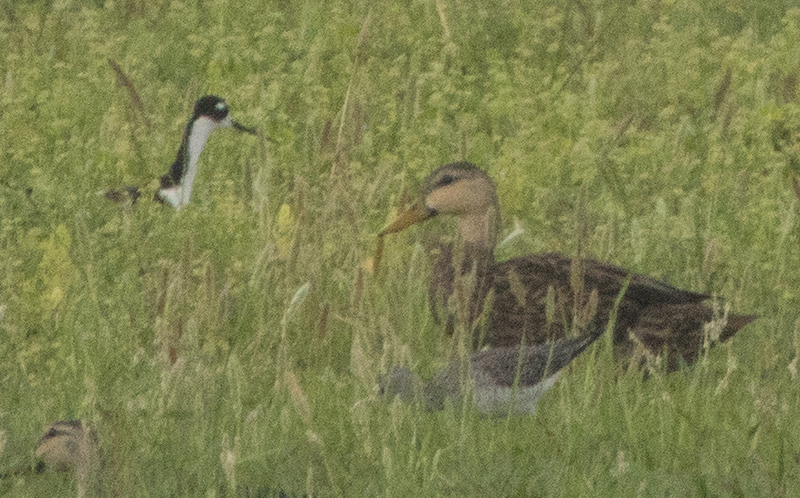 This photo has 3 good species: black-necked stilt, greater yellowlegs, and mottled duck. This was a great start to the morning. I pulled off the road to photograph this Sherman's fox squirrel, a species protected as a "State Species of Special Concern" by Florida’s Endangered and Threatened Species Rule. 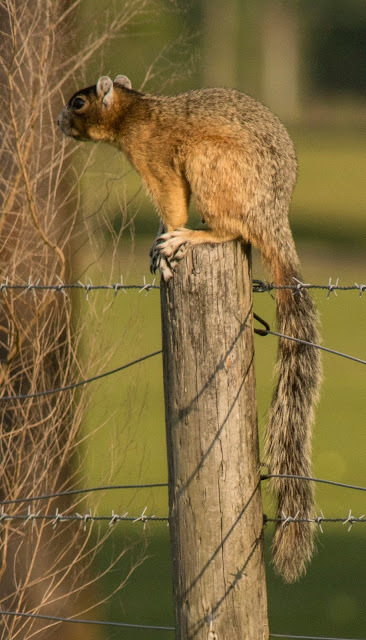 I never get good shots of the long tail, but this little guy cooperated today! 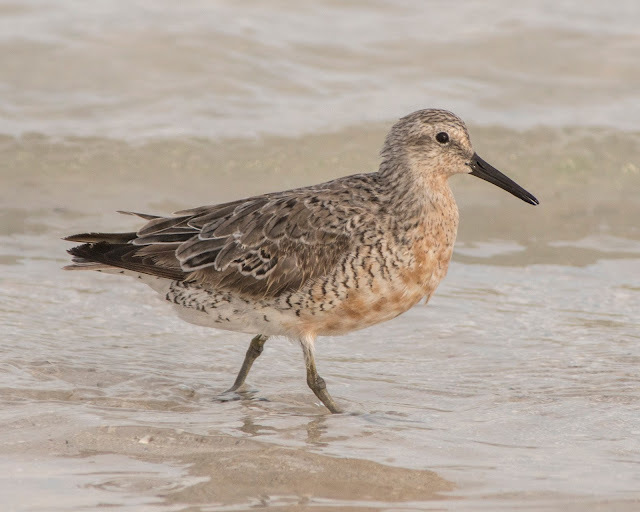 After photographing the red knots this morning, my mom and I walked the long stretch of beach all the way to the end. It is a 5+ mile round trip and started to get pretty warm by the time we were done at 11:30. 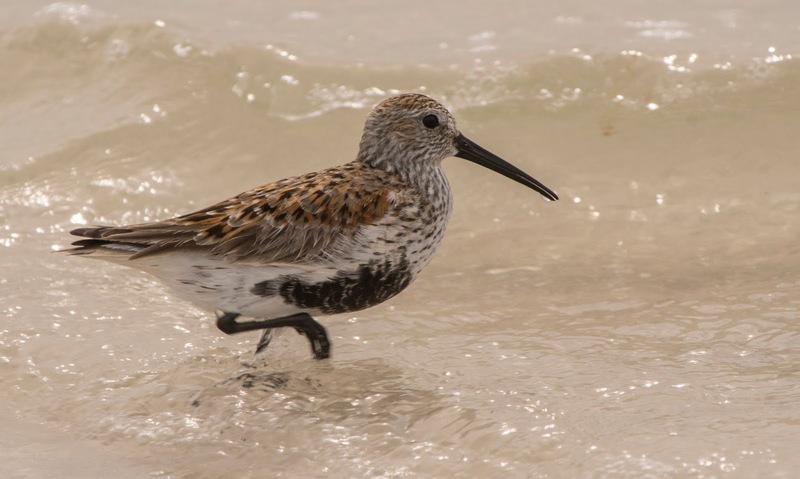 The most interesting bird was also one of the most common, the dunlin. 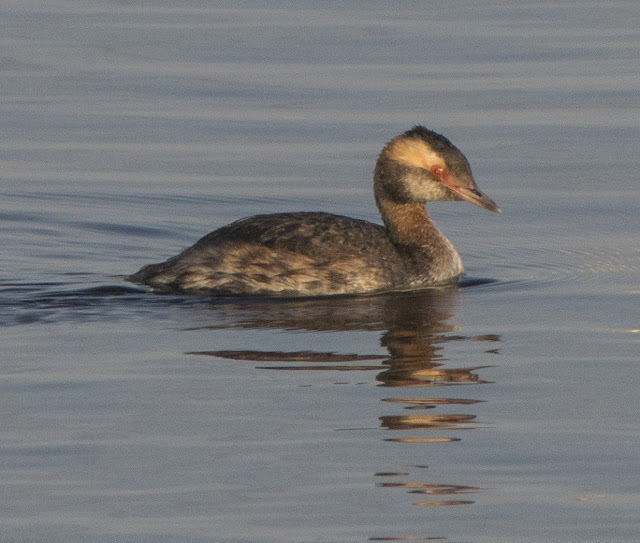 I had never seen them in breeding plumage before and actually thought I was looking at a new and unusual species! 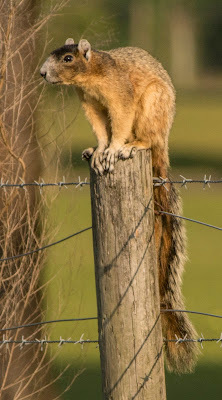 which I had never seen at this park before. 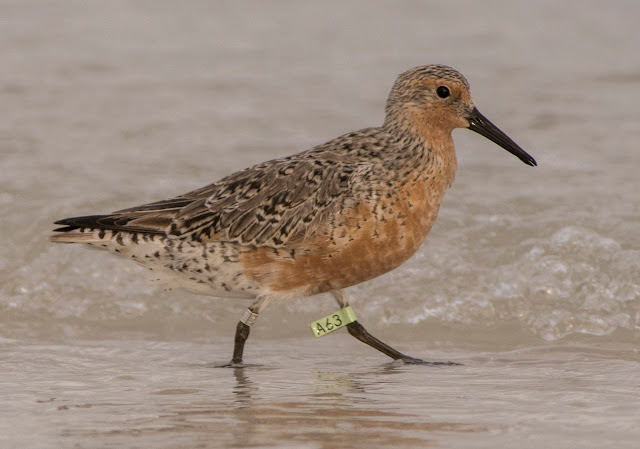 Sometimes the researchers contact you after you submit a banded bird, and I did get a response about this one! 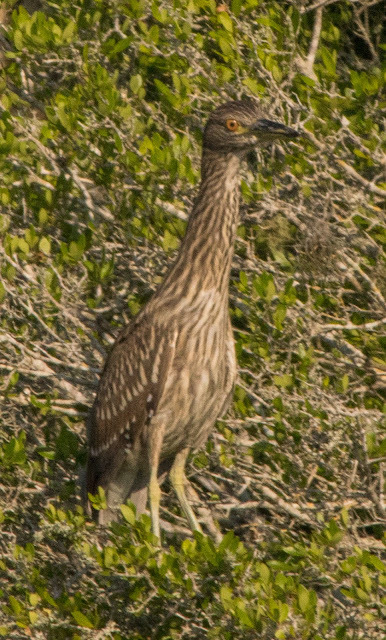 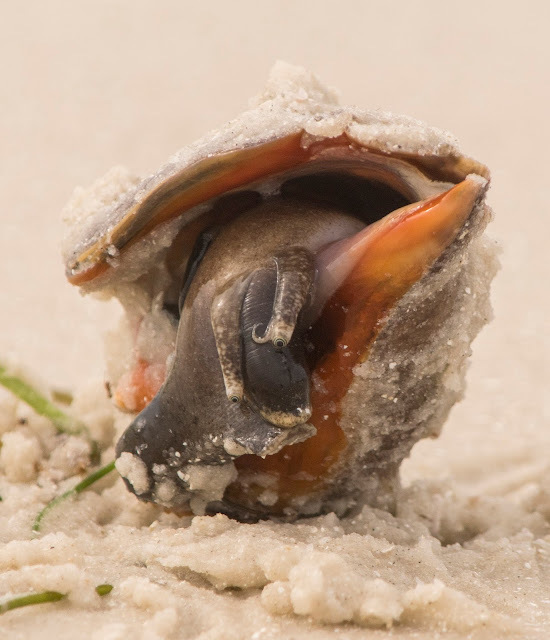 Hatched in 2013 or earlier, banded in 2015 in Louisiana. 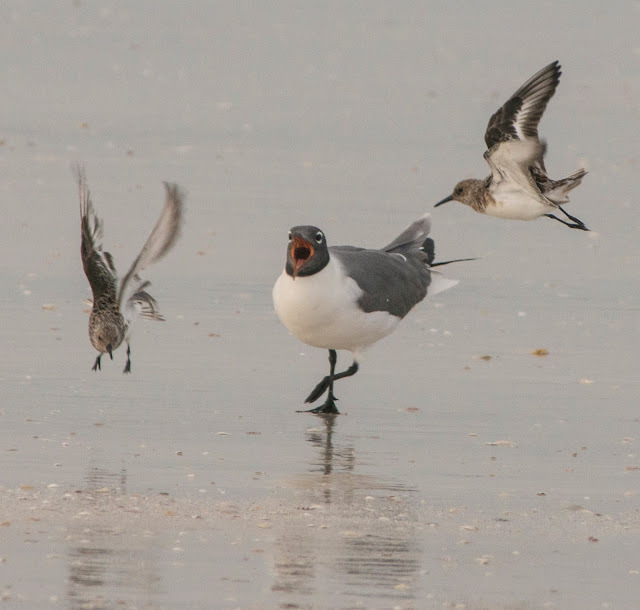 He was somewhat off the normal migration track I guess, so the researcher contacted me to confirm my information. 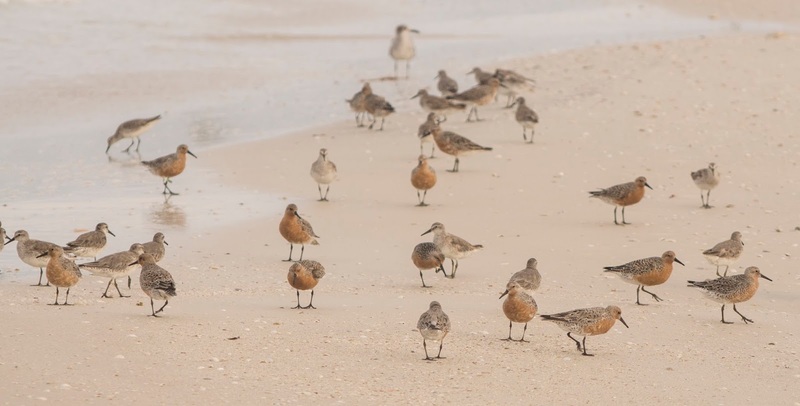 I have never been so close to red knots before, so I took a lot of photos today! 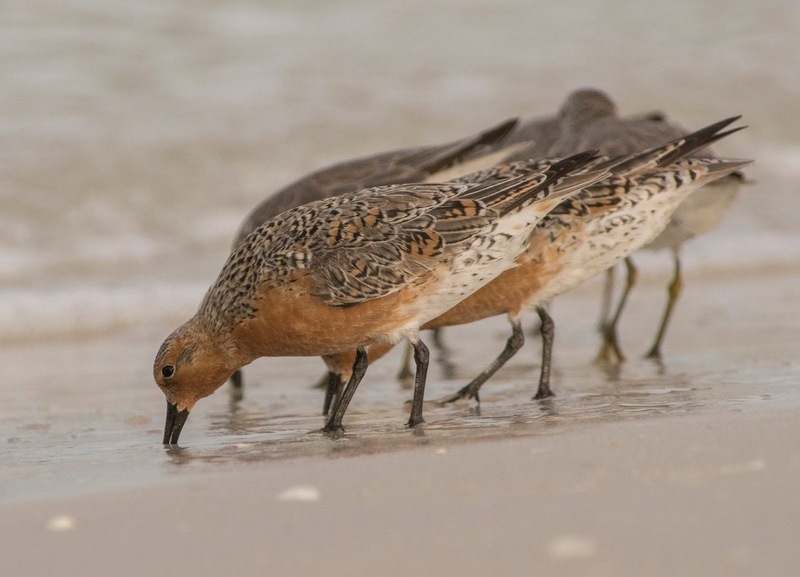 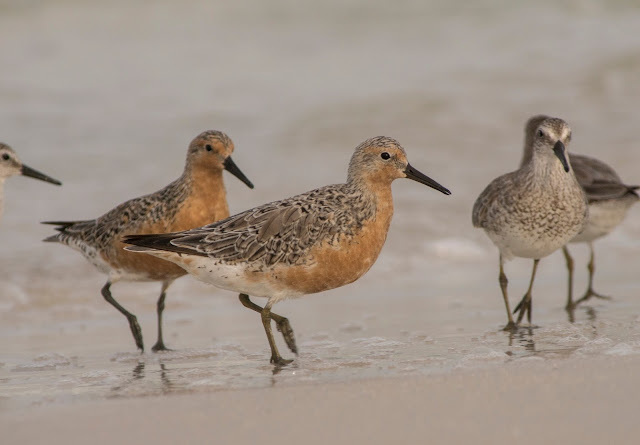 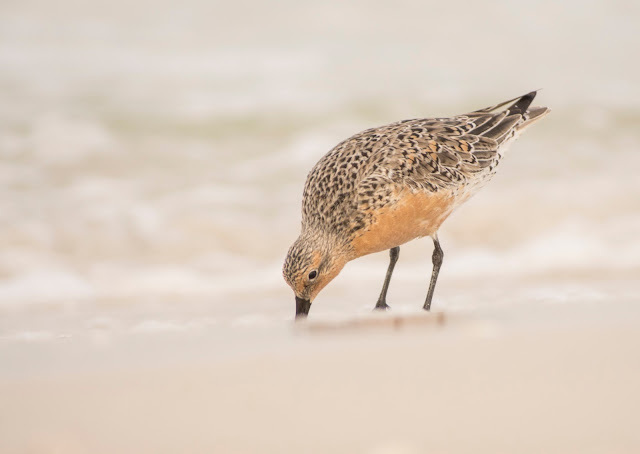 Unfortunately red knots are disappearing at an alarming rate and are now a federally protected threatened species.